We understand the importance of keeping your website up to date and secure. With ever increasing threats from hackers we have witnessed first-hand and dealt with the aftermath of attacks, which can be instructed by competing companies. Preventative measures, monitoring and proactive upkeep of the WordPress Core, Theme and Plugins are essential to being one-step ahead and keeping your website secure. 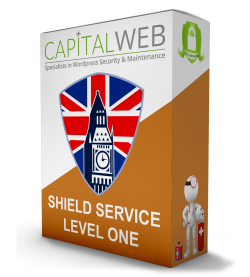 At Capital Web we go several steps further with our WordPress Maintenance and Security including prioritised progressive monthly updates. As directed within the capabilities of Capital Web Ltd’s in-house team. General development, telephone/email support, updates, security hardening, copy-writing and search engine optimisation. In the form of regular maintenance namely; security updates/patches, backups and frequent malware and blacklist checking. Respectfully and fairly at all times for customers. Discounts are available on all annual plans. When you place your order you can choose a payment frequency of monthly, quarterly or annual. Initial setup and familiarisation of your website takes 1-2 days from purchase. Any further questions please call 01959 447456.